Weihong 'Grace' Guo is an Assistant Professor in the Department of Industrial and Systems Engineering. She earned her B.S. degree in Industrial Engineering from Tsinghua University, China, in 2010 and her Ph.D. in Industrial & Operations Engineering from the University of Michigan, Ann Arbor, in 2015. Dr. Guo’s research interests are in the areas of statistical quality control and process monitoring, data mining for manufacturing and healthcare systems modeling and improvement, and quality-oriented design and modeling of complex manufacturing systems. Her current research focuses on data fusion methods in the interface between applied statistics and system control/optimization. She is a member of IIE, INFORMS, and ASME. 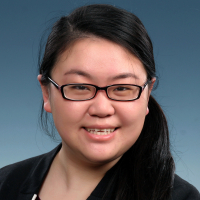 Dr. Guo is the recipient of the 2014 ISERC Quality Control & Reliability Engineering Best Student Paper Award Finalist, the 2014 International Conference on Frontiers of Design and Manufacturing Sciences Best Paper Award, the Rackham Predoctoral Fellowship from the University of Michigan, and the Wilson Prize for the Best Student Paper in Manufacturing. Her teaching interests include quality engineering, data analytics, and manufacturing systems. • W. Guo, R. Chen, and J. Jin, “On-line Eccentricity Monitoring of Seamless Tubes in Cross-roll Piercing Mill”, ASME Transactions, Journal of Manufacturing Science and Engineering, available online. DOI: 10.1115/1.4028440. [Earlier version published in ASME 2014 International Manufacturing Science and Engineering Conference collocated with the JSME 2014 International Conference on Materials and Processing and the 42nd North American Manufacturing Research Conference (pp. V001T04A010-V001T04A010), American Society of Mechanical Engineers, Detroit, MI, June 9-13, 2014.] • W. Guo, J. Jin, and S.J. Hu, (2013) “Allocation of Maintenance Resources in Mixed Model Assembly Systems”, Journal of Manufacturing Systems, 32 (3), pp. 473-479. DOI: 10.1016/j.jmsy.2012.12.006. [Earlier version published in the 4th CIRP Conference on Assembly Technologies and Systems, pp. 199–202, Ann Arbor, MI, May 20-22, 2012.] • A. Abad, W. Guo, and J. Jin, (2014) “Algebraic Expression of System Configurations and Performance Metrics for Mixed Model Assembly Systems”, IIE Transactions, 46 (3), pp. 230-248. DOI: 10.1080/0740817X.2013.813093. • B. Li, X. Li, W. Guo, and S. Wu, (2013) “A Generalized Stochastic Petri-Net Model for Performance Analysis and Allocation Optimization of a Particular Repair System”, Asia-Pacific Journal of Operational Research, 30 (1), pp. B1-B19. [Based on undergraduate thesis] DOI: 10.1142/S021759591250042X. Under review. • W. Guo, C. Shao, T.H. Kim, J. Jin, S.J. Hu, H. Wang, M. Wincek, and P. Spicer, “Online Process Monitoring with Near-Zero Misdetection for Ultrasonic Welding of Lithium-ion Batteries”, submitted to Journal of Manufacturing Systems (currently under 2nd round of review). • W. Guo, K. Paynabar, J. Jin, B. Miller, and J. Carpenter “A Decision Support System on Surgical Treatments for Rotator Cuff Tears”, submitted to IIE Transactions on Healthcare Systems Engineering (invitated to revise). Conference Proceeding • C. Shao, W. Guo, T.H. Kim, J. Jin, S.J. Hu, J.P. Spicer, and J.A. Abell, “Characterization and Monitoring of Tool Wear in Ultrasonic Metal Welding”, Proceedings of the 9th International Workshop on Microfactories (IWMF 2014), pp. 161-169, Honolulu, HI, October 5-8, 2014. Working Papers • W. Guo, J. Jin, and S.J. Hu, “Within-cycle Profile Monitoring for Real-time Defect Prevention”, to be submitted to IIE Transactions. [Earlier version published in Proceedings of the 11th International Conference on Frontiers of Design and Manufacturing (ICFDM), Nanjing, China, May 23-25, 2014]. • W. Guo, J. Jin, and S.J. Hu, “Within-cycle Profile Monitoring and Fault Diagnosis with Multichannel Signals”, work in progress.